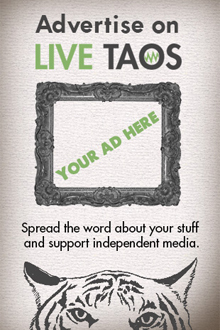 “New to Town” is a new LiveTaos series profiling people who have recently joined our community. Know someone who should be interviewed? Email [email protected]! I spent an afternoon with two artists who have recently relocated to Taos: Terry Graziano and Bruce Katlin. They’ve been married for twenty years and have learned the ins and outs of making an artist’s life work for them together. What stands out for me after the afternoon with them is this: they are funny. They are honest. They keep at it. And it is certainly not always easy. The interview below captures some of the highlights of our afternoon. Bruce is known as the running artist. He is a performance artist and a painter. Terry is a hat-maker. Visit their websites and social media channels for more about these two delightful new members of our Taos arts community. Kelley: Give me the 30 sec, what do you do? Terry: I’m a hat designer. 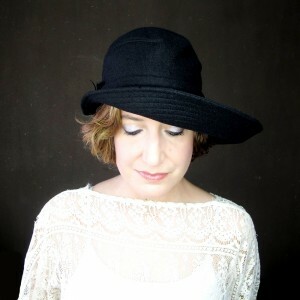 I design women’s hats that are able to be worn five or six different ways for each style. I’ve been doing that since 1991. Bruce: When I had finally had enough of my corporate job, and it was so bad, I said that I wanted to move to Taos. I felt like I needed to do it. I’m a painter, writer and performer. I’m known as the running artist. I paint on trail runs, mostly in the backcountry around Wheeler Peak. Next year I plan on taking people on guided painting, drawing and photography runs, hikes and walks. I’ll be utilizing many of the talented artists in Taos so that participants can have a choice of who they’d like to learn and create with. Additionally, I’ve also written and published a book, and am starting another, and I do a bit of theater here and there. Kelley: How is it with two artists living under the same roof? Terry: We have completely opposite energies. We’ve worked at home together at different points in our relationship so we know ourselves and each other pretty well. I’m an introvert so I like to have a door on my studio because Bruce is an extrovert. He gets an idea, he thinks of something, and he thinks “Oh, I have to go tell Terry!” I would like to be able to shut my studio door at 8:00am and not come out until 7:00pm. And Bruce, he’s the opposite. He says “why don’t you come visit me?” And I always think, “you’re in your studio painting, and I don’t want to interrupt you.” But Bruce, he does want to be interrupted. And then I remember that it is me who doesn’t like to bothered. I’m happy that Bruce is out there, quiet. Bruce: Yes, that’s very accurate. I don’t mind painting alone, really. Especially when I’m painting on a trail run, I like the solitude. But I need to get re-charged through another person. That could be a dog too. I need to get a dog. I’d also like a dog for protection and company when I’m out on a trail. Our studios work out pretty well actually. They are on opposite ends of the house. Except the kitchen is in the middle, and when I make myself a cup of coffee, I usually interrupt Terry. But it is tough, because I do respect Terry’s time. I also trust her opinion so I want to ask her. Bruce: Yes, yes, true. That’s what the little Bruce wants. But Bruce, the artist, wants the feedback. And I don’t always agree with her, and that’s ok.
Bruce: We also don’t approach the business part of our art in the same way either. That keeps it interesting too. I really get out there and create partnerships, and Terry is more internet based. Terry: I’ve gone through many iterations in my business. I used to do a lot of wholesale. For a long period I would do shows every weekend. And that was good at the beginning stages of my business. I learned what people were drawn to, how the hats fit different people and what people liked. After a while though it became more profitable to have a presence on the internet and sell through my websites. It is also better for me. When I would go out and do shows, then I’d be exhausted for two days afterward. Whereas for Bruce, when he goes out to connect with people, it really energizes him. Terry: And people will tell you. Bruce: And that is scary for any artist. And artists are very sensitive, and that’s what makes great art. It is like great comics. Great comics have a lot of tragedy in their lives. It makes them more sensitive. It takes a lot of courage to get up and do a piece. Terry: It is a practice in courage on a daily basis. It doesn’t really ever go away. Bruce: Here’s an interesting thing. A painting is finished when I’m happy with it. But I always wonder if I’m ever happy with it. Sometimes, maybe. Terry: I have thought a lot about that. When Bruce paints he has to put out there a final piece, but with my hats, I can send it to someone and they can tell me to make a few adjustments. Maybe it doesn’t fit quite right, and I can keep working on it. I still have opportunities to adjust it for the person wearing it. But with a painting, a buyer doesn’t ask you to add a dash more of orange so it will match my living room better. Bruce: Sometimes Terry, I know that you hesitate and think that you just can’t send out a finished product in a certain way. Terry: Yes, yes, I have a certain standard and I have to meet it. I used to design costumes with a friend. We had no budget, and we used to figure out how to make things work all the time. Bruce and I used to joke that I should have opened a business called “It Will Have to Do, Inc.” because we were always improvising with what we had. We didn’t have the budget for anything else. I used to design for a huge cast. I was doing that at the same time I was wholesaling my hats. Eventually I moved to the hats exclusively. But now, because my business is so much one-on-one, I hold myself to a higher standard. I try to get to know the person and understand how the hat will fit their personality. Kelley: What draws you to Taos? Bruce: The land, the people, and the light. I love the Wheeler Peak Wilderness Area. That’s where I’ve done a lot of my painting. Mostly it is the outdoors. I try to pay attention to the light. It is amazing. When I was in Chaco Canyon recently I kept taking photographs so I could capture that light once I got home. Terry: Bruce is very inspired by the atmosphere here. For me, I was a city girl for so long, it has taken me a bit of time to learn to see. Differently. I have learned to adjust my eye as to what is beautiful. And that’s been a very interesting process for me. My work is about silhouette and function, not so much about details. So I’ve been learning to observe the light and the shadows. Bruce: She rushes outside when there’s certain light to capture the shadows. Terry: Yes, I’ve also taking more blog photos outside, especially when they complement the tones in my hats. In the city, I always wanted to take my tripod out under the tracks in Chicago and photograph myself in a certain style, but that’s not really practical. Someone would take off with my camera. 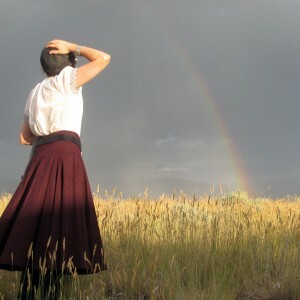 But here in Taos, I can go anywhere and no one really minds. I can photograph just about anywhere. And it’s lovely. Kelley: And yes, it is. It is lovely.